If a winter ski vacation to the Canadian Rockies has ever been on your bucket list, chances are you’ve heard of the town of Canmore. Neighbouring the town of Banff just east of the park gates, you’ll find this charming mountain community with a homey, down-to-earth vibe, spectacular scenery, and a pace unique from Banff and Lake Louise. You’ll rub shoulders with everyone from Olympic athletes, to seasonal ski bums, to families who have lived here for generations. It’s well-worth a visit to this quintessential Rockies town. 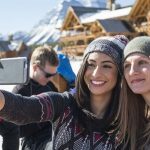 Whether making this location your ski vacation ‘home base’, or simply checking it out on your rest days from skiing and snowboarding, here’s what you need to know about your next visit to Canmore, Alberta. Canmore is the first major centre you arrive at when driving into the Canadian Rockies from the Calgary International Airport. Once you depart the airport, you can expect to arrive in this idyllic mountain town in just over an hour. 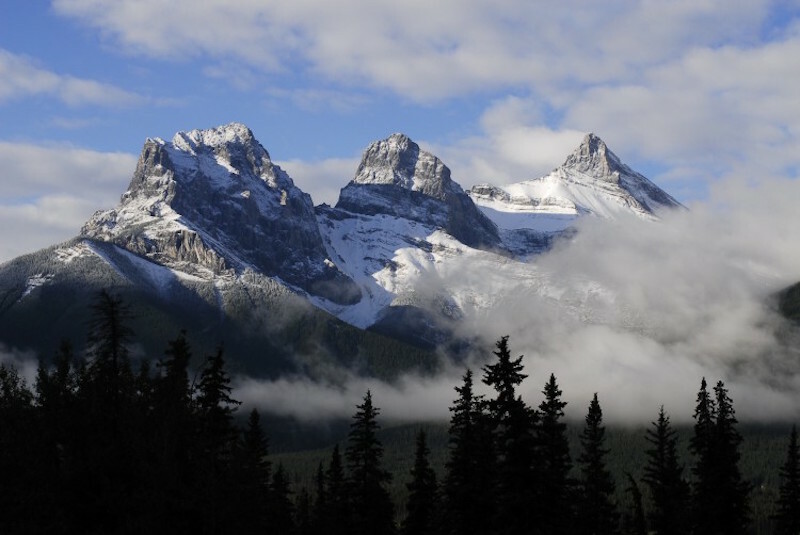 Canmore is located 25 kilometres east of the town of Banff, 30 kilometres from Mt. 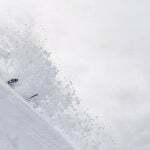 Norquay, 40 kilometres to Banff Sunshine Village and 80 kilometres to Lake Louise Ski Resort. Getting to Canmore is easy! A seamless airport shuttle will get you from A to B in no time, or for more flexibility, personal vehicles are available for hire. Public transit is available between the towns of Banff and Canmore, however, SkiBig3 ski shuttles operate only between the town of Banff, the village of Lake Louise, and the three resorts, so we recommend a personal vehicle for greatest convenience if you opt to make Canmore your home base. To make the most of your time here, renting a car right from arrival at the Calgary International Airport will best suit your transportation needs for this kind of trip. 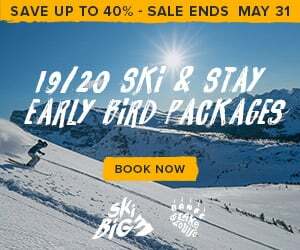 While Canmore itself is not located in Banff National Park, you’re still required to purchase a park pass if stopping at any of the SkiBig3 resorts. Be sure to stop at the park gate to pick one up, or purchase a park pass online to avoid car queues and save time. 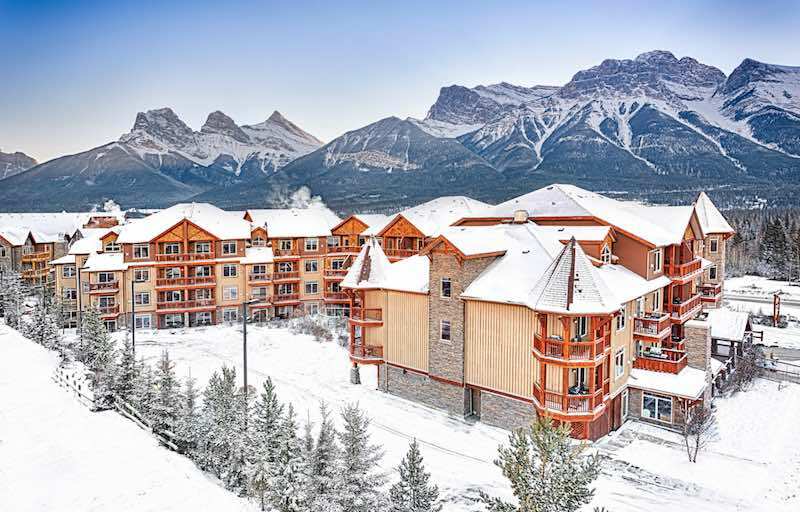 Canmore is a condo haven! Great for families and group getaways, you’ll be spoilt for choice for trendy mountain lodging in this beautiful town. Larger units, condos, and one to two-bedroom units complete with kitchenettes are plentiful here. Clique Hotels are a great start to finding the best condo for you. Stoneridge Mountain Resort, Falcon Crest Lodge, and Blackstone Mountain Lodge all offer spacious, luxurious condo-style suites with the best amenities for an enjoyable stay – hot tubs, fitness centers, WiFi and outdoor pools. Other options include Solara Resort, complete with a movie theatre and on-site One Wellness Spa to indulge and unwind. Grande Rockies Resort offers everything from Economical Guest Rooms to Grande Penthouses – no matter which room you choose, you can enjoy their indoor swimming pool, 3-storey water slide, and indoor/outdoor hot tub. 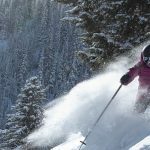 Rocky Mountain Ski Lodge is another great place to stay, centrally-located in Canmore with great value and added services. 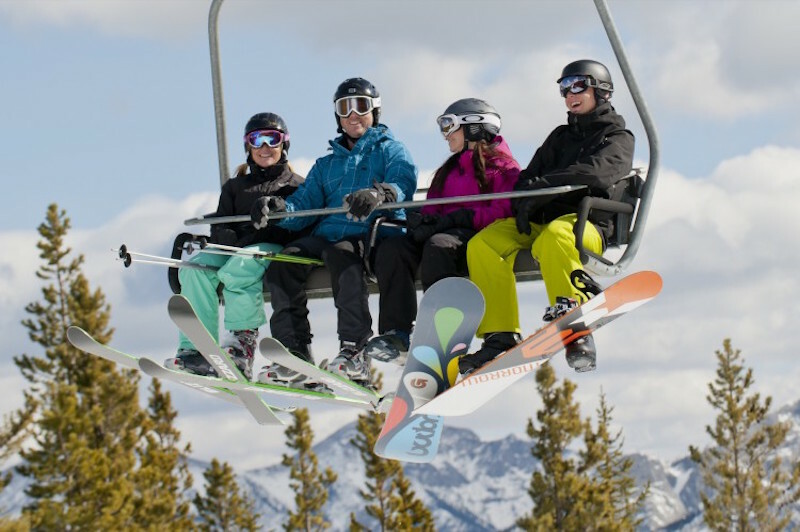 If you’re sticking around the Rockies for awhile, there’s plenty to explore off the ski resort slopes. 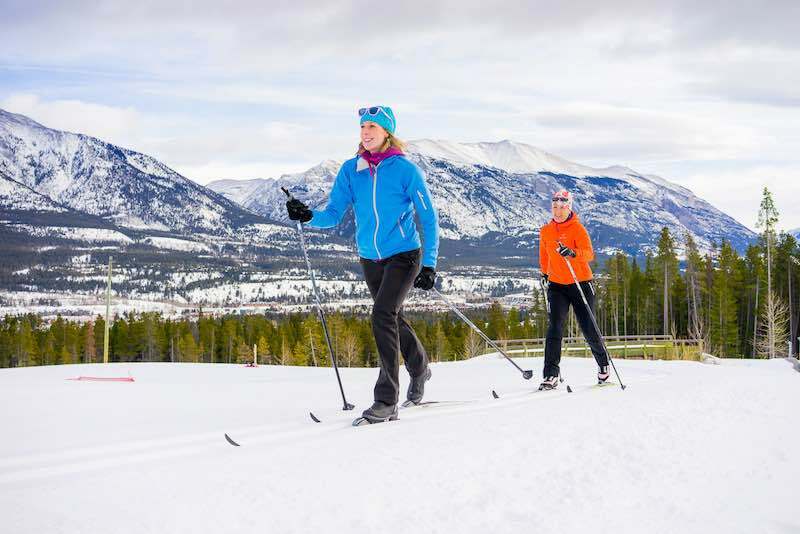 The Canmore Nordic Centre, home to several 1988 Winter Olympics events, features a variety of cross-country ski tracks suitable for all abilities. Kids need to burn off some energy? Take them to Elevation Place – a family-friendly recreation centre featuring massive climbing walls and an aquatics centre, complete with a waterslide and a children’s play area. Want to enjoy the fresh winter air a bit longer? Outdoor skating is great fun no matter your age. Whether at a maintained rink or ice au naturel, you’ll love the magical experience of skating amongst snowy, towering mountain peaks. Check out these favourite skating spots in Banff, too! If your ski legs are in need of a little R&R, just walk them on down to Wild Heart Canmore. This Yoga Barre Studio is taught by instructors who are skiers themselves, and know the best stretches and poses to suit this style. 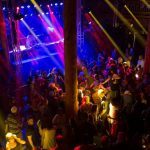 While you’ll find the exciting bustle in Banff and the reclusive ‘off-the-grid’ feel in Lake Louise, Canmore is the happy medium of upbeat nightlife and downtown energy. For late night dancing or a simple game of pool and a pint, the action happens at The Drake Pub every weekend. 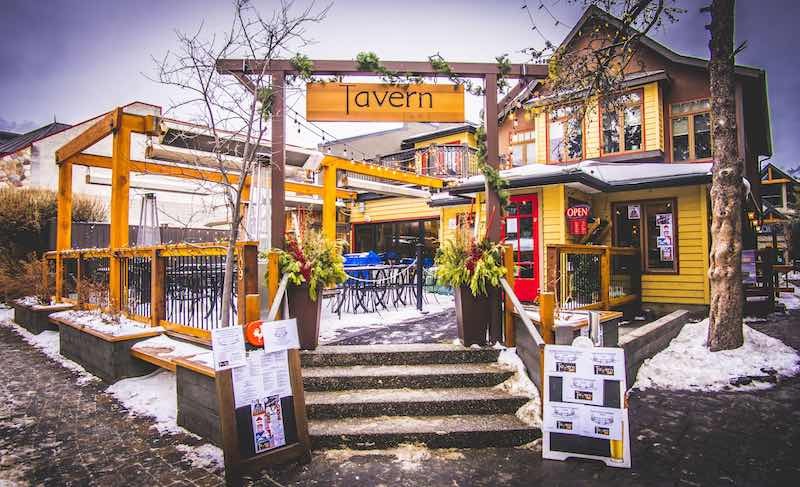 You’ll find the locals congregating at the Tavern 1883, which features DJs and bands on different nights of the week. For something on more of the eclectic side, Where the Buffalo Roam features delightful craft cocktails with a quirky ambience. The Grizzly Paw features locally brewed beers and sodas, with a buzzing patio come springtime. Want to grab a bite to eat first? Canmore’s lively restaurant scene is always bursting with fresh new dining joints and trusted local favourites. Chez Francois is a sure-to-please brunch spot, specializing in eggs benny and crepes. Plus, there’s a coffee shop on nearly every block – at every one, your taste buds will be delighted from first latte sip. Rocky Mountain Bagel Co. is a popular spot to get breakfast on the go (if you aren’t enticed to settle in to their comfy chairs by the fire). Communitea Cafe’s bright and open corner location offers healthy menu items sourced from local and organic ingredients whenever possible. Plus, they specialize in gluten free, vegetarian and vegan options. 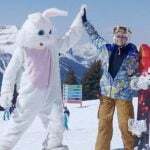 Thinking of booking a Canadian Rockies ski vacation? 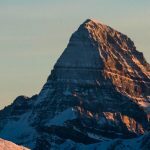 Consider making Canmore your base for adventure!